York is renowned for its Park and Ride sites, of which there are now six with this newest facility. The opening of this latest 600 vehicle capacity site at Poppleton Bar, just off the A59, now sees all A roads to the city covered by a Park and Ride facility. All are operated by the city’s primary bus operator, First. 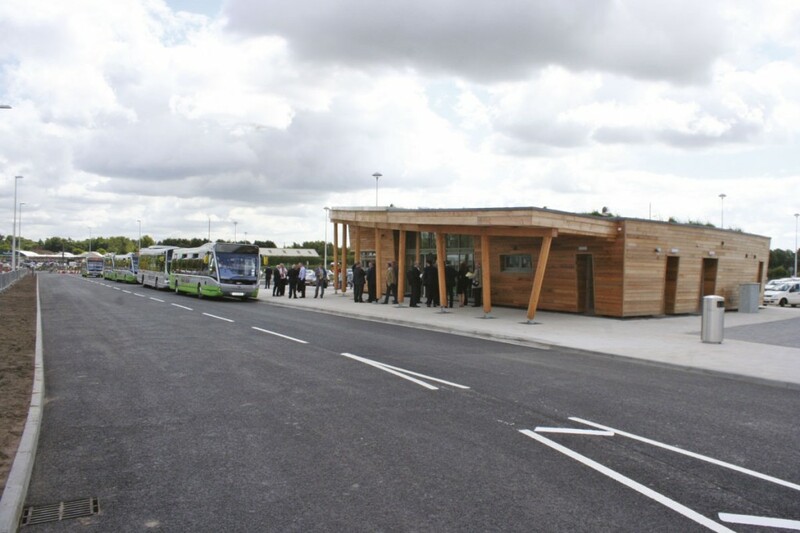 The new Park and Ride site at Poppleton Bar, complete with wood cladding and a turf roof. Key to the green credentials of the Poppleton Bar site are the six new Optare Versa EVs. Operating service 59 between York city centre and the new Park and Ride, they run weekdays between 07.00 and 19.45 on a ten minute frequency. On Saturdays, they operate from 07.00 to 08.30 every 15 minutes and then every ten minutes until 17.40. Sunday operations start at 09.30, running every ten minutes until 17.40. An adult single is £2, with a day return costing £2.70 and parking is free. According to First’s Director of Strategy UK Bus, Nigel Foster, the electric buses on the Poppleton Bar service were already attracting positive comments from passengers. 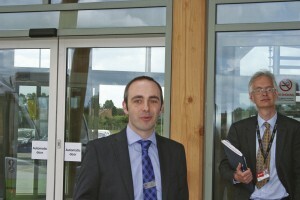 Both sites were created in partnership with contractors Balfour Beatty and designers CH2M Hill. The latter carried out the preliminary design, detailed design, contract procurement and construction supervision for the client. Introducing the new Park and Ride site is intended to reduce congestion levels. Major improvements being made to the nearby A59/A1237 roundabout to further help alleviate congestion, which were ongoing during the launch. It is not only congestion the service aims to alleviate, but pollution too. This was the reason behind the purchase of electric Optare Versa EVs. Their drive systems and components were designed and manufactured by Sheffield based Magtec. Over their operating lifespan, the vehicles are expected to save over 7,500tons of CO2 emissions in York. They are not wholly emission free; they have auxiliary power from a small diesel generator for heating the interior. Part funding for the single deckers came from DfT’s Green Bus Fund, which contributed £1.2m towards them. They are not the first electric buses in the city, nor the first Optare electrics as Transdev York is already operating a Solo EV electric bus on the city’s University Loop route. 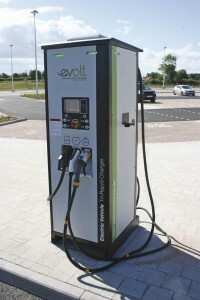 Electric charging infrastructure for the six new Versas was supplied by APT Technologies, which provided its evolt units. Two short charge power points were installed at the Poppleton Bar site, designed to give vehicles a quick boost while in service. Installed at First’s depot are facilities enabling the buses to be charged overnight, giving them an 80 to 90 mile range (depending on operating conditions). According to Nigel, this range has proved sufficient in service so far. As well as the electric vehicles and charging units, other green features at the new Park and Ride site include a turf roof (or ‘living roof’) and a charging point for electric cars. 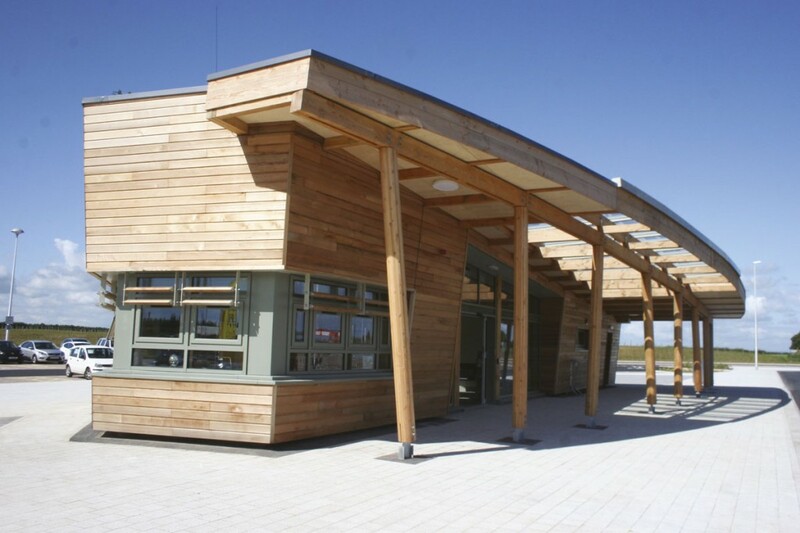 Aesthetically, the building itself is pleasing to the eye, featuring wood cladding. To help York meet its goal of becoming one of the best digitally connected cities in Europe by 2015, all six Park and Ride terminals and on board services across the city are set to get free wi-fi. 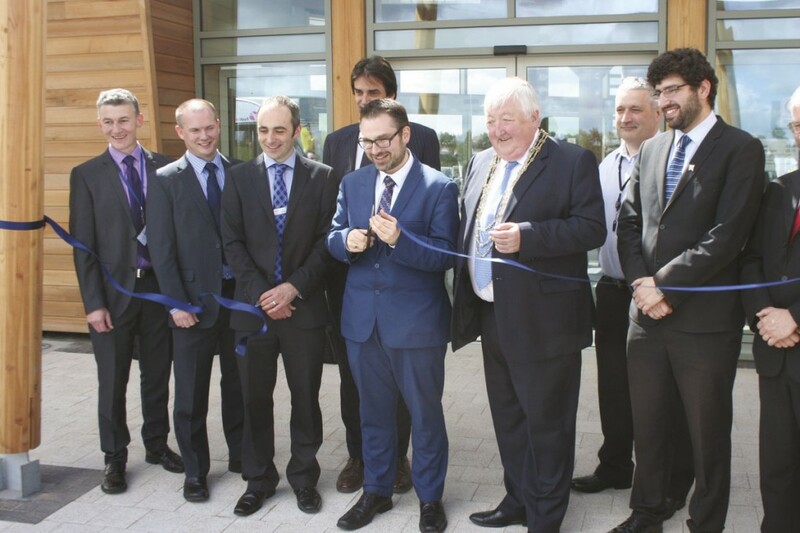 To mark the opening of the Poppleton site, a ribbon cutting ceremony was held during the launch. Along with various councillors, dignitaries and others involved in the project, the event was attended by Enrico Vassallo, CEO of Optare. 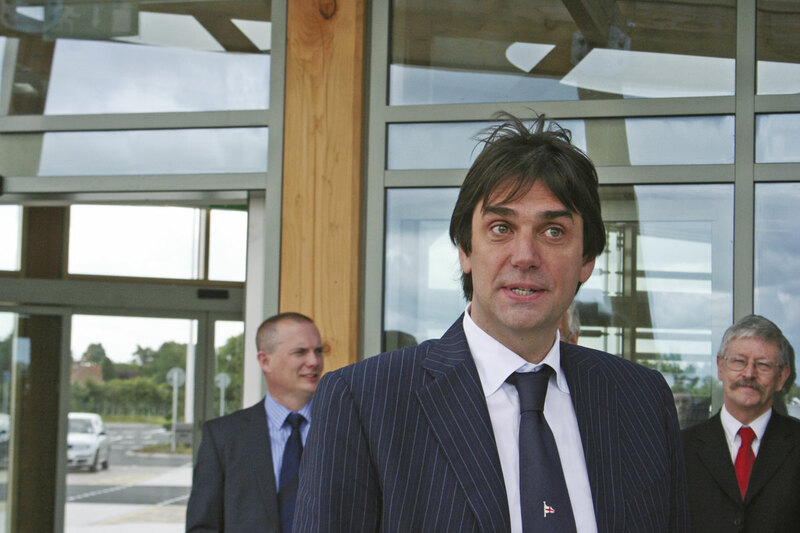 Enrico made a speech emphasising that the investment in the Yorkshire based manufacturer’s electric buses was an investment into the local economy. MD of First in York, Ben Gilligan, said in his speech he was proud to be operating ‘one of the best Park and Ride sites in the country’. The success of the sites, according to Ben, partly comes from providing a punctual service, mentioning the recent positive Passenger Focus reliability scores. However, he said he realised he ‘couldn’t do it alone’ and praised the City of York for the part it played in introducing the new service, paying tribute to its hard work with the DfT and private sector partners. 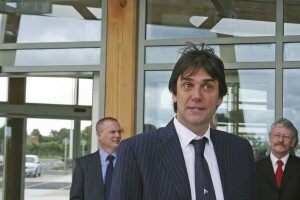 He was pleased with the decision to go with Optare, echoing Enrico’s point earlier that it was a ‘local investment’. He then went on to say that the drivers were given training in the vehicles prior to them going into passenger service. The main difference compared to diesel equivalents he mentioned was to the way they brake, with the electric Versas slowing more when the throttle is eased off, requiring less braking. In addition to these electric Versas and the new Park and Ride site, expect more investment in York. The city was one of the four Better Bus Areas named last year, giving it a share of £16.5m. The council aims to spend £1.4m on measures to assist bus services between now and 2018. Across the city’s wider transport network, new investments are being made as part of the local authority’s i-Travel York initiative, made possible by £4.6m of government funding. A further £100,000 was also secured from the DfT in April towards this scheme.